August 2, 2018. Leh, Ladakh, J&K, India – This morning His Holiness the Dalai Lama was invited to Eliezer Joldan Memorial (EJM) College, a government degree college in Leh. He was welcomed at the door to the auditorium by the Principal Deskyong Namgyal and escorted to his seat on the stage. More than 1500 students and staff sat before him on the carpeted floor. After students had sung a song that began with taking refuge in the Buddha, Dharma and Sangha and went on to praise His Holiness, the Principal formally welcomed him for his first visit to EJM College. He explained that the College was first set up in 1994 and offers degree courses in science, arts and commerce. In 2004 the Jammu & Kashmir Government decided to name the College after Eliezer Joldan, who, coming from a Christian family, was the first trained graduate to teach in Ladakh. President Otsal Wangdu told His Holiness how honoured the students and staff of the College were to receive him, assuring him of the College’s interest in combining modern education with ancient Indian knowledge. With a nod to the staff, His Holiness greeted his respected elder brothers and sisters and smiling at the students, saluted them as his special younger brothers and sisters. “The most important thing for us to remember is that the 7 billion human beings alive today are all the same in being human. We are mentally, physically and emotionally the same. I emphasize this to counter the way we so often pay too much attention to secondary differences of nationality, religious faith, race and so forth. Here in the 21st century we should exert ourselves to make this a happier, more peaceful world. Many of the problems we face are of our own making and have their origins in our categorizing people in terms of ‘us’ and ‘them’. “We need to think more deeply about this. We all have the same desire to live a happy life, so wherever I go I advise people to recall the oneness of humanity. Scientists tell us they have evidence to show that basic human nature is compassionate. We are social animals, we depend on other people, just as Ladakh depends on Jammu & Kashmir and J&K depends on India, while India depends on her neighbours. This is a reality we have to accept. We Tibetans pray for the welfare of all sentient beings, but we really only pay attention to our little corner of the world. We have to develop a more realistic attitude. “Human beings have a remarkable brain and intelligence that allows us to anticipate and plan for the future. We have language that enables us to communicate and we have education. In the past, education was the province of religious institutions. In ancient India the practices for developing a calmly abiding mind and penetrative insight (shamatha and vipashyana) gave rise to a thorough understanding of the workings of the mind and ways to tackle our emotions. “Today, just as we teach physical hygiene to protect our health, we also need some kind of emotional hygiene, involving guidance about tackling our destructive emotions, in order that we may also be mentally fit. However, if we ask whether modern education is an adequate means of ensuring that individuals, families and communities are happy, the answer is doubtful. What is required is a more holistic approach that balances modern education’s orientation towards material goals by paying greater attention to inner values. Members of the audience who wanted to ask His Holiness a question stood up and a microphone was delivered to them. Answering a question about the need for socio-emotional learning, His Holiness observed that we see problems on individual, family and national levels that are related to emotions. He said that if you develop peace of mind, it’s possible to remain unruffled whatever happens. 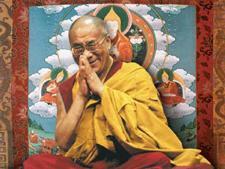 Asked how to develop wisdom, His Holiness stressed the need to be sceptical to ask why? and how? Knowledge and understanding are essential. Prayer based on faith is not sufficient. Another student wanted to know how it’s possible to cultivate meditation in the context of a busy life. His Holiness told her that it’s at times of crisis that you can apply analysis to understand what’s going on. This is similar to the way patience is only tested and developed in response to situations that would otherwise make you angry. When a young man observed that human beings are a threat to the survival of other species and wanted a solution, His Holiness agreed that human beings, despite their marvellous intelligence can also be shockingly destructive. He compared this to the behaviour of predators like lions and tigers. He told of being surprised at Hyderabad zoo to see a tiger in the same large enclosure as a herd of deer. He asked if the deer weren’t in danger and was told that so long as the tiger was well-fed nothing was driving it to attack the deer. 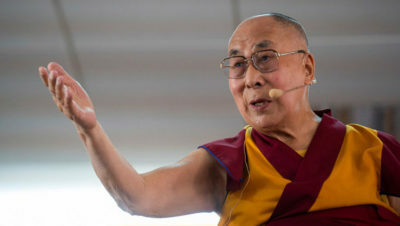 His Holiness conceded that human beings tend to over-exploit natural resources, as well as other animals. One countermeasure would be to cultivate a more inclusive respect for all forms of life. Another young woman wanted His Holiness to tell her how to remain compassionate when dealing with someone who makes you angry. He recommended examining whether anger has any value. It’s part of the mind and may at some time have had a protective function to do with survival. But, when we are angry our ability to decide what to do is clouded. What’s more we act in ways and say things that we later regret. Scientists advise that constant anger, fear and hatred undermine our immune system, whereas maintaining a compassionate, peaceful state of mind supports it. Where anger is an impulsive response, compassion and loving kindness are founded on sound reason. They give us confidence, inner strength and determination. An enquiry about contentment elicited a response that material development is necessary, but that it needs to be balanced by peace of mind. A sign of a lack of contentment that His Holiness regrets is the rising rate of suicide he’s heard about in Ladakh. Japan, another Buddhist country, is highly developed, and yet the suicide rate is also high. “We need to ask what happiness is,” His Holiness observed. “Happiness like compassion is related to the mind. Therefore, a more holistic education should focus more on mental consciousness and less on sensory pleasure. To understand how to achieve happiness it would be helpful to have a better understanding of the role of the mind and mental consciousness. Challenged to say whether the practices for developing a calmly abiding mind or for developing penetrative insight were more effective, His Holiness reiterated that he has found analytical meditation more useful than tranquil meditation. However, to be able to do analytical meditation effectively it’s necessary to be able to focus the mind on the object you are examining without its being distracted by some sensory attraction. He suggested that students recite the Praise to Manjushri and his mantra 21 times, rest in silent meditation for some time before engaging in whatever analysis they wish to pursue. The final questioner wanted to know how to keep her cool when provoked. His Holiness thanked the audience for their questions and told them he’d enjoyed talking with them. Before leaving the hall, he posed for photographs first with the teachers and staff and then with the students. From EJM College he drove back to Choglamsar where he turned right, crossing a bridge over the Indus, heading for the village of Chushot Yokma and the Imam Barga Mosque where he was made welcome for lunch. His Holiness joined his hosts for a brief prayer on entering the mosque, after which everyone sat down. “Dear brothers and sisters,” His Holiness replied, “whether we like it or not, we human beings have to live with each other on this planet. In Ladakh, whether you like it or not, Muslims have to live with their Buddhist brothers and sisters, and Buddhists have to live with their Muslim brothers and sisters. Many of the problems we face today arise because we place too much store by narrow national interest, religious affiliation and so on. “Among Muslims, Sunnis and Shias pray to the same Allah, but quarrel with each other. Buddhists pay tribute to the same Buddha, yet indulge in sectarian conflict. I really admire the spirit of the European Union whose members have put the common interest ahead of mere national concerns. I don’t understand the British decision to leave. Now is a time for giving first consideration to our common interests. Tibet was an independent state, but now we and China can be of help to each other. “When it comes to religious affairs, inter-religious harmony flourishes here in India. As a Buddhist I try to promote such harmony wherever I go. I believe that Indian Muslims have a responsibility to their brothers and sisters in the Arab world and Afghanistan, for example, to promote religious harmony, especially where it consists of a conflict between Sunnis and Shias. It’s time for Indian religious leaders as a whole to be more active in sharing their experience that it is possible for religious traditions to live peaceably side by side in appreciation and respect.